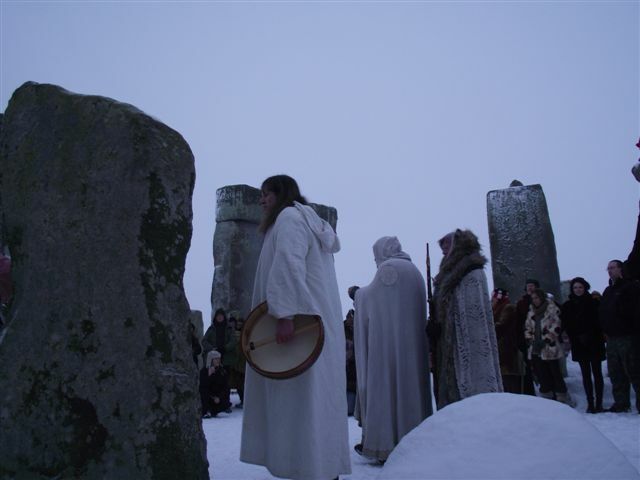 The celebration of the Winter Solstice at Stonehenge will take place at sunrise on Saturday 21 December 2013 (approximately 08:09 hrs). Visitors will be allowed into the Monument when it is considered sufficiently light to ensure safe access. Entry will be available from approximately 07:30 hrs until 09:00 hrs when visitors will be asked to vacate the site. All vehicles must vacate the area by 09.30. Access might not be possible if the ground conditions are poor or if it is felt that access might result ¡n severe damage to the Monument. Toilets are available at Stonehenge for the duration of the access although these facilities will not be available prior to access commencing. Public car parking will be made available on Byway 12, the old Visitor Centre Car Park and along the A344. Disabled parking will be in the old Visitor Centre Car Park, and will require a special permit. Visitors to Stonehenge will get the chance to explore an impressive new visitor centre close to the ancient site later this year. English Heritage today announced that the first phase of its long-awaited £27million improvements to the area will be launched to the public on 18 December, in time for winter solstice on 21 December. The new visitor centre will house a permanent exhibition that will offer visitors the chance to learn more about the famous monument. They will be able to ‘stand in the stones’ thanks to a 360-degree virtual experience before they enter a gallery where they will be able to view nearly 300 prehistoric artefacts and displays that reveal facts and theories about the ancient monument. Many of the archaeological finds – which are on loan from various museums including the Salisbury and South Wiltshire Museum – will be on public display for the first time. The first temporary exhibition will chart over 800 years of theories about who built Stonehenge – from 12th-century legends to radiocarbon dating reports in the 1950s. The environmentally-friendly building, which has been designed by Denton Corker Marshall, features a café, shop, dedicated education space and visitor’s car park, and will offer tourists free audio guides. English Heritage’s chief executive Simon Thurley said: “This world famous monument, perpetually described as a mystery, finally has a place in which to tell its story. Volunteers will begin work on the construction of a group of Neolithic houses in January. The buildings, which are expected to be finished by Easter, will be based on houses where the builders of Stonehenge may have lived, complete with furniture and fittings. The final phase of the project – the restoration of the landscape around Stonehenge – will be completed by next summer. The Avenue, Stonehenge’s ancient processional approach, has been reconnected to the stone circle after being severed by the A344 road for centuries. The £27million project has been financed almost entirely by Heritage Lottery Fund money (£10million), English Heritage commercial income and donations. From 18 December, entrance to the site will be managed through timed tickets and online booking opens on 2 December at www.english-heritage.org.uk/stonehenge. Stonehenge, which was constructed between 3,000 BC and 1,600 BC, attracts around 900,000 visitors a year, and is particularly popular during the summer and winter solstice. It is still shrouded in mystery as nobody is sure how or why the giant boulders were transported hundreds of miles to be constructed at the site. However, scientists now believe that Neolithic engineers may have used ball bearings in the construction of Stonehenge. The same technique that allows vehicles and machinery to run smoothly today could have been used to transport the monument’s massive standing stones from Wales to Wiltshire more than 4,000 years ago, according to the theory. Two ditches belonging to the Stonehenge Avenue buried beneath the modern roadbed of the A344 have been uncovered during works to decommission the road as part of English Heritage’s project to transform the setting and visitor experience of Stonehenge. linking it with the River Avon. It has long been considered as the formal processional approach to the monument and is aligned with the solstice axis of Stonehenge. But its connection with Stonehenge had been severed by the A344 for centuries as the road cut through the delicate earthwork at an almost perpendicular angle. The two ditches were found in excavations undertaken by Wessex Archaeology in their expected positions near to the Heel Stone, about 24 metres from the entrance to monument. The Avenue is difficult to identify on the ground but is clearly visible on aerial photographs. Once the A344 has been restored to grass in the summer of 2014, interpretation features will be put in place to clearly mark out the solstice alignment to enable visitors to appreciate the position of the Avenue and its intimate connection with and significance to Stonehenge. The recent prolonged spell of dry weather has also led to some exciting discoveries within the stone circle. 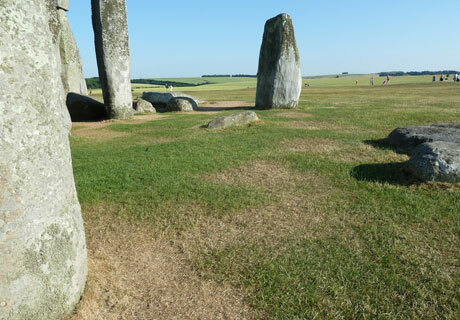 Two eagle-eyed members of staff spotted some dry areas of grass, or parchmarks, amongst the stone circle in July. After investigation by English Heritage experts they seem to be positions of three holes where stones 17, 18 and 19 might have stood on the south-west side of the outer sarsen circle. NOTE: This story as reported in the Guardian on 9 September contains a number of inaccuracies. The article, including the headline, failed to distinguish between fact and interpretation, and presented one expert’s view as established fact. It also gives the impression that the expert’s view has been adopted by English Heritage. This is very confusing. 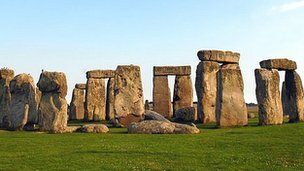 English Heritage is firmly of the view that Stonehenge was built as a prehistoric temple aligned with the movements of the sun, contrary to what was implied in the article. Professor Mike Parker Pearson’s theory about the naturally formed ridges is interesting, but is by no means established. English Heritage’s role was to record any archaeology that survived under the A344 and present the results of the recent discoveries clearly to the public. 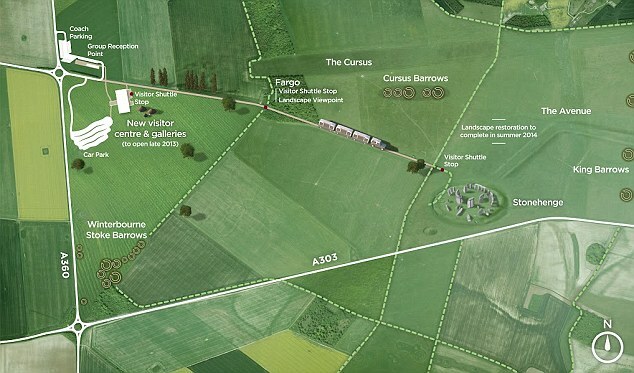 English Heritage’s interpretation of Stonehenge in general will be presented at the new visitor centre due to open in December 2013. We have a duty of care to ensure public safety and are responsible for protecting Stonehenge and its surrounding Monuments. If we are to ensure that future access is sustainable, it is essential that everyone observes and abides by these Conditions of Entry. Stonehenge is an ancient prehistoric site and has been a place of worship and celebration at the time of Summer Solstice since time immemorial. During Managed Open Access for Summer Solstice at Stonehenge, we support all individuals and groups conducting their own forms of ceremony and celebration providing that they are mutually respectful and tolerant of one another. It is a place seen by many as a sacred site – therefore please respect it and those attending. SOLSTICE CAR PARK TO BE VACATED 1200 hours (12 Noon) Friday 21st June – see Travel and Parking for further information on travel and parking arrangements. A visit to Stonehenge is bound to make you ask: who built it? Towards the end of the 19th century, archaeologists began to realise that Stonehenge could be much older, linking finds to the Bronze Age. William Gowland’s excavations in 1901 showed that Stonehenge was built in Neolithic or early Bronze Age. Today, we think the stones were raised about 2,500 BC by the native inhabitants of late Neolithic Britain. 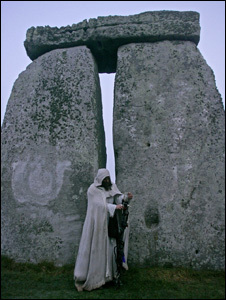 John Aubrey Proposed that Stonehenge was a temple built by the Druids, the priests of the pagan Celts, who came to England in the centuries immediately prior to the Christian era. 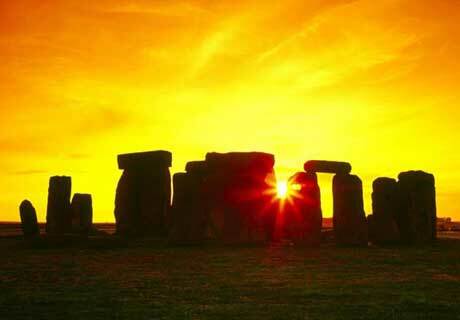 William Stukeley The first person to recognise the alignment of Stonehenge on the solstices. Like John Aubrey, however, he mistakenly attributed their construction to the Druids. Inigo Jones Believed the stones were a Roman temple of the Tuscan order built to the sky god Coelus. Later disproved by evidence establishing the period in which the stones were first laid. Stonehenge was built before metal began to be used in Britain. The most common finds from this period are flint tools required for everyday activities such as hunting, making leather and preparing food. We know from animal bones that the people who constructed Stonehenge had livestock and probably also grew small quantities of crops, but still gathered wild plants and hunted wild animals. Whether visiting in 1958 or today, children have always been fascinated by Stonehenge. At the time that Stonehenge was built, people across Britain were using a type of flat-based decorated pottery called Grooved Ware, often found at late Neolithic monuments across Britain. Many of these prehistoric finds can be seen at Wiltshire Museum, Devizes, at Salisbury and South Wiltshire Museum and at the new Stonehenge visitor centre later this year. Until a few years ago, experts thought late Neolithic people were largely mobile, moving between seasonal temporary camps. But in 2006, a team led by Professor Mike Parker Pearson, part of the Stonehenge Riverside Project, discovered several small buildings at Durrington, just over two miles north-east of Stonehenge. These houses appear to have been inhabited on a temporary, seasonal basis about 2,500 BC, the time that Stonehenge was built. Was this where its builders lived? Among the excavated houses were mounds of rubbish, including cow and pig bones and broken Grooved Ware pottery, showing that large midwinter feasts were held here. Nearby were complex timber monuments, buildings set within special enclosures and other strange wooden structures. This was a place of ritual, probably connected to the ceremonies at Stonehenge. After the settlement was abandoned, an enormous henge called Durrington Walls was built, which is still visible today. 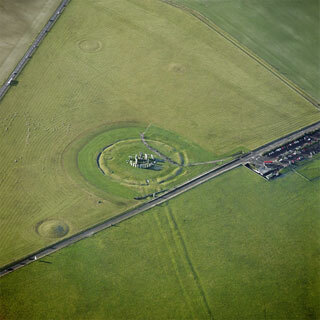 Part of Durrington Walls and nearby Woodhenge are English Heritage properties you can explore. You can walk from Stonehenge across the fields to Durrington Walls, perhaps the route that its builders took. You’ll see other fragments from the past—the enormous Cursus monument, which pre-dates Stonehenge, and many of the early Bronze Age round barrows that scatter this area. There are further clues in the monument itself. Transporting the stones, shaping them and fitting them together took great organisation and hundreds of people in what was a sophisticated and organised society. You can find out more at Stonehenge’s new visitor centre later this year. 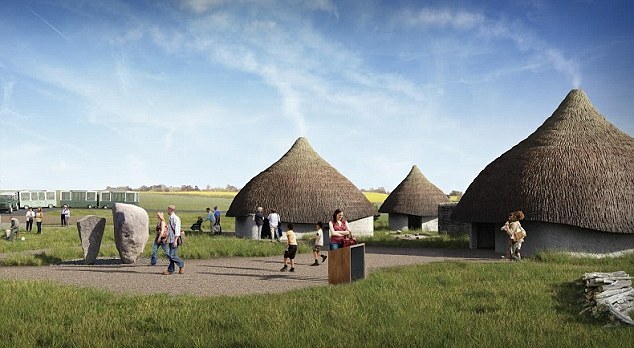 Outside the new Stonehenge visitor centre will be an external gallery, where we’ll be recreating three of the late Neolithic houses excavated at Durrington Walls. Here you’ll be able to see what life was like at the time Stonehenge was built. And at Old Sarum, Wiltshire, volunteers are building some prototype houses to test different ideas about the methods and materials used. You can follow the progress of our project on our blog at www.neolithichouses.wordpress.com and our Twitter account @NeolithicHouses. If you’d like to get involved with building the houses at the visitor centre next year, or working in the external gallery, keep an eye on our website for volunteering opportunities. 25-27 May Learn about Neolithic life as part of an open weekend. A TOPPING out ceremony was held at the new Stonehenge visitor centre on Wednesday as the last piece of steel to support the canopy roof was welded into place. The zinc and timber roof has been designed to blend into the landscape and to let in more sunlight in the winter while creating shade in the summer. Loraine Knowles, Stonehenge director for English Heritage, said: “It is fantastic to see the building taking shape and to see how well it sits in the landscape. “Progress with the creation of the interior spaces for the museum galleries, education area, shop and cafe is equally exciting because it is now possible to see on the ground how these great new facilities will be experienced by our visitors. 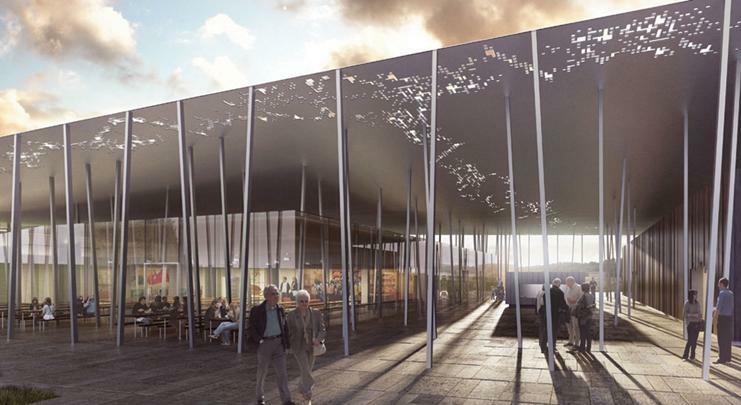 English Heritage’s £27million project to transform the visitor facilities at Stonehenge will see the new centre open in December, with the existing facilities to be demolished and grassed over by next June. In an open letter, King Arthur Pendragon has criticised English Heritage for the “macabre manner” it plans to display “ancestral remains”. In 2011 he lost a High Court bid to have bones, found in 2008, reburied. English Heritage said the remains are not from the 2008 excavation and their “presentation, treatment and storage” will follow strict UK guidelines. The cremated remains of more than 40 bodies, thought to be at least 5,000 years old, were removed from a burial site at the ancient stone circle five years ago. “There are cremated remains and a full skeleton from one of the barrows, which they’re planning to put on display,” he said. The £27m scheme to build a new visitor centre and close the road alongside the ancient monument, is due to be completed by the end of the year. Mr Pendragon said visitors would be “appalled” and unless “models and replicas” were used he could “not rule out non-violent direct action against the proposals”. But a spokeswoman for English Heritage said visitor research showed the “vast majority of museum visitors are comfortable with, and often expect to see, human remains”. “The remains of three human burials found in the landscape will be displayed with ample explanation along with archaeological objects, providing visitors with a direct connection to the people who lived and worked there,” she said.